I’ve started another doily. The one I was working on is just taking too long to get right. I have the framework done on this new one. Now I will begin filling in all the loops and middles. Patting it out for a photograph did not go well, so I am wondering if it will block out OK. Doilies look so messy before blocking. That is why I like to wait to photograph them finished. If all goes well it should be really pretty when it is done. 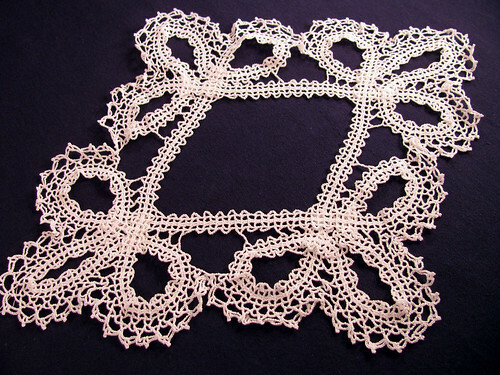 This entry was posted on Wednesday, February 18th, 2009 at 3:00 am and is filed under Crochet and Doily. Tagged: Crochet, Doily, Lace. You can feed this entry. You can leave a response, or trackback from your own site. All of your doilies are so beautiful! That looks just amazing! I gave you a Kreativ Blogger AwaRD on my blog.